Geological time as recorded by sedimentary rocks can preserve distinct intervals in which biotic crises resulted in global mass extinctions. These intervals are termed mass extinction events and relate to the relatively rapid and widespread annihilation of many species. To date, there are five recognised mass extinction events, with the most popularised being the end-Cretaceous mass extinction that ended the life of the dinosaurs 66 million years ago. Some 200 million years ago, another significant mass extinction event occurred at the end of the Triassic. This event is also recorded in a unique package of sedimentary rocks called the Elliot Formation, which is part of the fill in the main Karoo Basin in southern Africa. Scientists believe that studying these ancient rocks will unlock the secrets relating to the end-Triassic mass extinction, the 3rd largest extinction event the world has seen. To record and study a biotic crisis, a rock package must have two important components. The first is an abundant and diverse range of fossils to observe biodiversity changes. The second is a means of dating these fossils to provide a timeline. Luckily, the Elliot Formation ticks one of these boxes. It hosts a wealth of fossils with such diversity as is seldom seen in continental deposits. This has allowed palaeontologists to loosely label the Elliot Formation as ‘Triassic-Jurassic’ in age. Datable material in the Elliot Formation, such as diagnostic palynomorphs (fossil pollen and spores) or radiometric ages (from zircons in volcanic ash beds), have long eluded capture! Instead, a novel method for dating rocks using rock magnetism (termed palaeomagnetism) was attempted. Palaeomagnetism is, essentially, the study of variations in the Earth’s magnetic field in deep time. Since the direction of the Earth’s magnetic field has changed several times in the geological record, studying the rates and number of these changes recorded in rocks, allows for scientists to get a more accurate idea of the age of the rocks. Importantly, for this method to work the rocks must contain magnetic minerals. Thankfully, the Elliot Formation is what is commonly known as a ‘red bed’ succession, and is named so because of its distinct brick-red colouration derived from iron oxide minerals (e.g. hematite). These same iron oxides provide a unique way to date the rocks as they have the ability to retain a magnetic signature. And indeed, primary magnetizations are preserved in rocks of the Elliot Formation. This means that these rocks record the Earth’s magnetic field as it was approximately 200 million years ago. The magnetic signatures recorded in the Elliot Formation rocks build a unique magnetic polarity timeline, using magnetostratigraphy, and provide a ‘finger print’ or ‘barcode’ for this particular rock package. 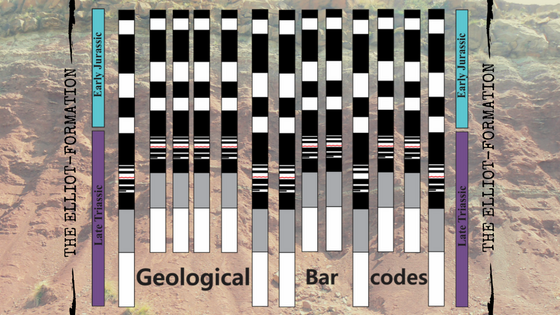 The ‘barcode’ can be utilised to constrain the relative age of the Elliot Formation. This relative age aids in configuring the timeline and occurrence of the end-Triassic mass extinction event and Early Jurassic post-extinction recovery in the Southern Hemisphere. In trying to understand these far-removed biological events, we can get insight into how we perceive and recognise the current sixth (Holocene/ Anthropocene) extinction. This innovative Upper Triassic-Lower Jurassic magnetic barcode was developed during Dr Lara Sciscio’s PhD research. The new magnetic chronology suggests that the Elliot Formation ranges between ~214 – ~190 million years. This gives firmer age range for the Elliot Formation than previously thought. These exciting results, presented in the journal ‘Gondwana Research’ (see reference below), provide a backbone onto which the biostratigraphic evidence and pending radiometric dating of the Elliot Formation can be placed. These disciplines can also further refine the current magnetic polarity chronology of the Elliot Formation. Significantly, this new evidence highlights the importance of the southern African Elliot Formation in global research. In so doing, it may bring into question the amplitude of the end-Triassic mass extinction on land.